Without doubt Newcastle Central Station is one of the landmark railway stations in the British Isles. It is approached from the south by either one of two magnificent bridges across the river Tyne which afford splendid views down the river. The east end of the station, until the 1960s formed the city centre terminus for both north Tyneside and south Tyneside electric services, with these trains crossing over what was once the biggest railway crossing in the World. I remember spending many an hour as a teenage train spotter in the central station capturing numbers of Deltics, Peaks, and Brush 4’s, and watching the resident 03 diesel shunters go about their business along with the normal station pilot 31 411. The station then was quite run down and quite a lot of investment has been made in the intervening 30+ years to make the facilities in Newcastle quite pleasant. In still a regular visitor, but not as a train spotter, instead as a businessman boarding the East Coast 125 and 225 services to London most weeks. 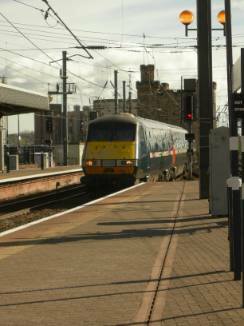 I do always carry a camera, and just occasionally it comes out to record the current railway scene. A £15 million transformation of Newcastle Central Station and surrounding area is now confirmed after the Government awarded an additional £4.95 million to business improvement district company, NE1 Ltd from round two of the Regional Growth Fund. Newcastle Central Station is to be transformed into a magnificent sweeping gateway to the region with state of the art facilities for passengers, coaches, Metro, bus services and taxis with total confirmed investment now sitting at, at least £15m. Jobs are expected to be created by the investment with more secured through the economic regeneration of the area. The money comes days after the announcement that Network Rail has been awarded £8.6 million to transform the interior of Central Station. Both NE1 and Newcastle City Council will augment these figures with their own additional funding contributions. NE1 Ltd acted as a catalyst for the combined project, bringing together Network Rail and Newcastle City Council to make coordinated bids for different pots of funding. The collaborative team worked hard for over 2 years to map out a visionary plan for the Station and its surroundings. The money now secured will provide the key to unlock not only the major redevelopment of this immediate area but will also facilitate the regeneration of other areas around the station. The Central Station is crucially placed within Newcastle to act as a gateway to the city and its redevelopment will have a major impact on other areas including the Quayside, Science Central, Grainger Street and Clayton Street, leading up into the commercial heart of the city. The plans will seek to create a modern transport hub to provide enhanced links to key city centre locations through public realm improvements. The work will celebrate the unique heritage status of the classical Grade I listed station, designed by John Dobson. Network Rail plan to transform the station’s interior providing modern retail and leisure facilities, improved passenger waiting accommodation and toilets, better signage and alterations to the existing bridge, while adding lifts and escalators to make it easier to move around precious heritage listed building. There will also be improved glazed canopies to flood the station with natural light. NE1 and the City Council plan to improve the area around the Central Station for pedestrians, drivers, cyclists and visitors to the city and help kick-start the economic regeneration of the area. This will include upgrading pavements, remodelling the road layout and better signage to help improve the look and feel of the city, creating a clear and open pathway for pedestrians into the commercial heart of the city. The redevelopment work will begin in mid-2012.